Heat oven to 300°F. Unroll dough sheet; press dough in bottom of ungreased 13x9-inch pan. Top with 24 slices of the pepperoni (6 rows by 4 rows). In medium bowl, beat eggs, cream and Italian seasoning with wire whisk until well blended. In 10-inch skillet, heat oil over medium heat. Add bell pepper and onion; cook 4 minutes, stirring occasionally, until crisp-tender. 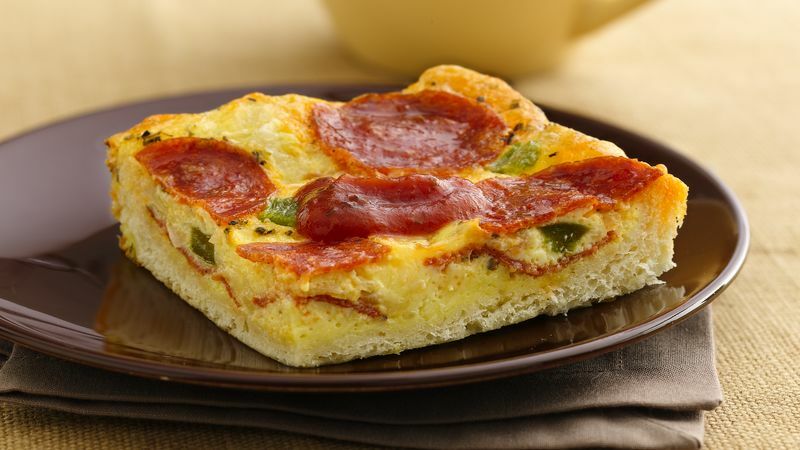 Stir vegetable mixture into egg mixture; pour over pepperoni in pan. Sprinkle with cheese. Layer with remaining 24 slices pepperoni. Bake 35 to 45 minutes or until edges are light golden brown and center is set. Cool 5 minutes. Cut into 12 servings; place on plates. Drizzle 1 tablespoon pizza sauce over each serving.